Hmmm, I'd have to pass on both sadly. I had something similar on black.I miss those shoes so much! Ooooooh amazing find, darling E! I def want a pair of boots like these for fall!!! Leave it to you to find the most lovely boots ever. I think I would splurge for the Chloe boots. I might not be able to afford either..but I can dream. How cool. I think I might have splurge! I would probably go with the Coconuts pair. Those Chloe ones sure are lust-worthy, though! Ugh...I can't afford either at the moment! But I actually like the way the Coconuts pair looks better. They're cute though definitely not my style. I saw an inspired-by version in Zara as well. I prefer the Chloe colorway, but in general think this shoe is too trendy to splurge on! But they both look great! Wow, so cute. Perhaps leather for fall/winter and canvas for spring/summer! I need them both in my life!! Both are stunning, I simply can't choose. Both versions are super cute! I don't know if I could pull either look off though. They are both great, I would wear either pair! p.s. I'm hosting a giveaway if you're interested! I really like the Chloe pair. I purchased the Coconuts a few weeks ago though and I like them too. I have no idea how I'm going to style them yet, but so far I like it when I stand in them naked thinking. So adorable. I'll be on the look out for this style. I think I like the cheaper ones better! if i were to buy one of those it'd be the cheap ones. they look better in my opinion. hope you had a wonderful weekend darling! I definitely think the Chloe version is better. I think I have seen a few bloggers with those shoes too. The shoe to have. But I'll stick with my high-tops. Serious?? Aside from the canvas vs. leather situation, I can't tell the difference! These are so hot!! Totally a tightwad on this one! Something so nostalgic about these. I am the thrifty one. I love the colors of the bargain ones -- so cute! I actually like the Coconuts by Matisse version better. 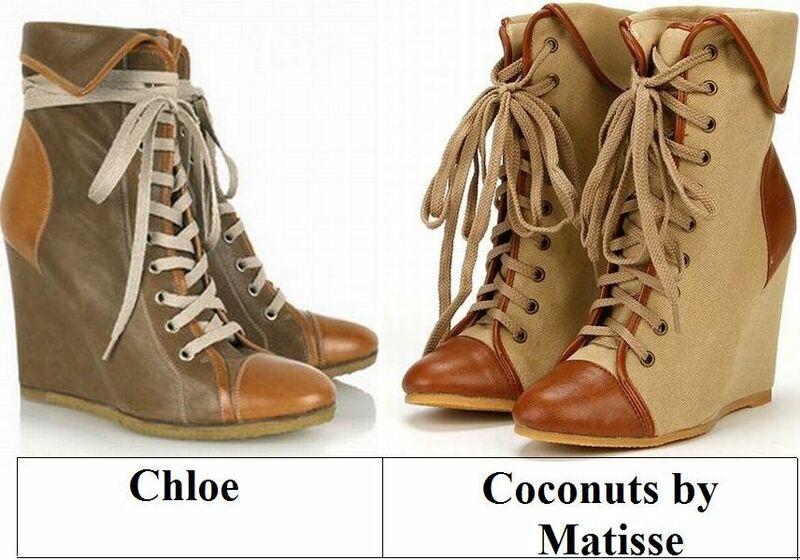 I like the canvas and think the coloring is a lot better on those than the Chloe pair. I think those boots could actually look nice if worn correctly. and you should check in Zara, they 're even cheaper and look fantastic!